The Zettai Seiiki -Sanctuary- event was an all day long event with many idol groups. Venus Project was one of the guests, and the members who participated were Hata Sawako, Hayase Marika, and Nemoto Ruka. This was the first of two events in Osaka this day. The second event was the Aba Fes event. I arrived at Wktk Theatre at 11:55. The entrance was small and it didn't look like a theatre so I walked around the building at first. I eventually went in and went upstairs to the second floor. They had the bar counter and a small room to sell goods. 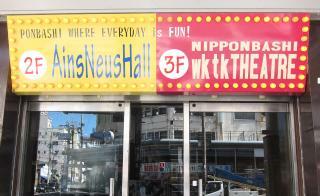 The live stage was on the third floor. They were selling Venus Project goods before the stage started. They started selling a new CD at this event, Venus Project Character Song CD Battle 08 Kashima Yuu vs Hara Eriko. I bought two CDs, and got two tickets for the high touch session. Then I went up to the third floor. The previous performer was on the stage, and there were around 25 people in front of the stage. But there were more than 10 Venus Project fans waiting in the back. This was an "all standing" event. The stage itself was pretty high, but the hall itself was pretty small. The stage was around 5 meters across, and around 5 meters deep. Pretty good visibility even if you weren't in the front row. When the Venus Project stage started at 12:20, around 30 fans rushed to the front. I got a front row spot on the very right side. The Venus Project stage lasted around 40 minutes, and flowed as follows. The girls were wearing their Venus Project outfits that they first wore in November 2015. The outfits were similar in style, but not matching. Sawako was wearing a short sleeve white frilly blouse, grey (or light blue) vest, grey skirt (with white frilly lace on top), and a white beret hat. Marika was wearing a white frilly blouse, grey vest, and black skirt. Ruka was wearing a white frilly blouse, grey skirt, and a large black belt. About 15 minutes after their stage ended, they started selling the CDs and other goods on the second floor. Then the high touch session started around 13:30. I went twice, and left right away, as there was another event later. There are some details of my trip to/from Osaka in the other event report.